Every year your selection of classic sports cars diminishes. More and more manufacturers have opted to replace analog delight with digital complexity. One by one, top echelon road burners like Mercedes’ SLS AMG GT and Porsche’s 911 GT3 have augmented driver skill with so many computer based driving aids that you – the supposed operator – are virtually eliminated from the decision-making loop. In addition, manual gearboxes are quickly disappearing from top line sports cars in favor of semi-automatic gear changers that further sap satisfaction from the driving equation. 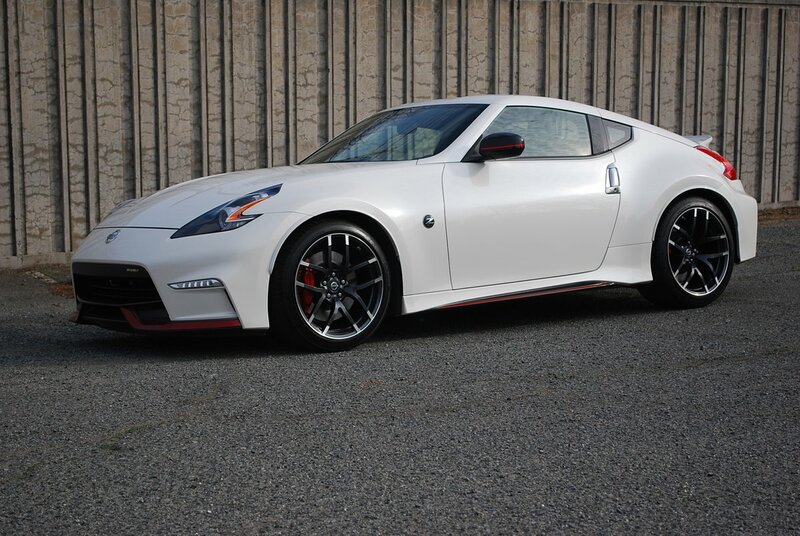 But if you’re not ready for the dubious attributes of this brave new world, then join me in spending a week with one of the few classic sports car you can still buy at an affordable price, Nissan’s outstanding Nismo Tech version of the 370Z. It can be yours for just $46,425. The current base model 370Z is a stout performer in stock form. Under the hood lies a 332hp, 3.7 liter V-6 coupled to a 6 speed manual gearbox. The stiff, race bred chassis boasts independent suspension at all four corners, disc brakes for each wheel, and fat 9 and 10 inch wide alloys front and rear measuring 19 inches in diameter. These wheels carry high performance 245/40R19 radials at the front, and 275/35R19 rear tires. 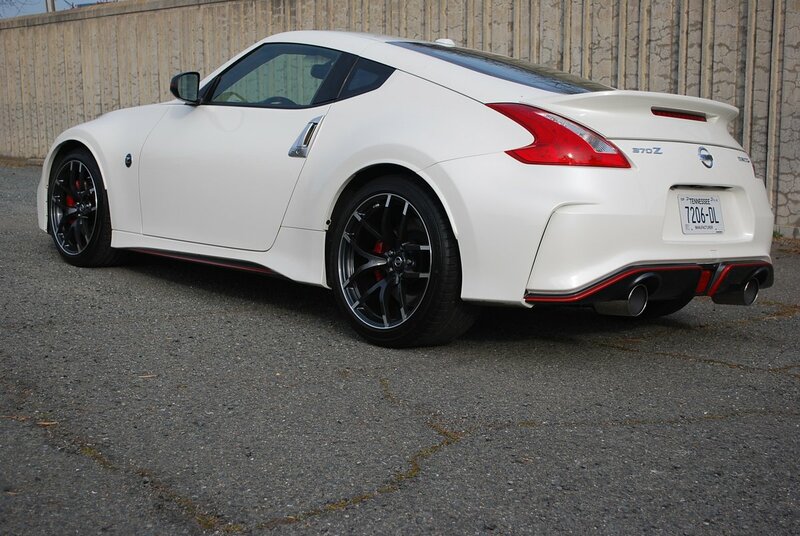 While this refined engine/chassis combo would be enough to sate most drivers, the ultimate enthusiast will always opt for the Nismo enhanced version of the Z. For starters, its V-6 bumps horsepower to 350, and torque to 276lb.-ft. That’s a useful increase of 18hp and 6lb.-ft. over stock Z specification. Another attractive improvement is the addition of half inch wider, lighter, forged Rays alloy rims in place of the stock Z’s cast wheels. 9.5 inch wide front wheels carry Bridgestone’s latest ultra high performance Potenza, the S001 (245/40R19), while rear 10.5 inch alloys mount 285/35R19 Potenzas. When you combine that heftier footprint with a Nismo-tuned suspension, special race bred Vibration Dampers (i.e., shocks), and add a 3-point front strut tower brace, you’ve got a refined platform that’s just itching to strut its stuff at autocrosses and track days. Nissan continues the laser focused improvement over stock Z components by installing first class Recaro racing seats that will hold you like Velcro while you fling this go-kart through turns. These beautifully crafted seats, finished in black leather with red Alcantara inserts, fit your torso like a suit of body armor. Their No. 1 job is to keep you pinned securely in place, and this they do with remarkable success. On a constant radius, sweeping 180 degree freeway off ramp, I was never able to generate enough speed to deter the Nismo from its leech like grip on the road, nor did I ever slide one inch across the surface of those captivating Recaros. The small diameter steering wheel matches the seating surface with its Alcantara grips, and even offers a red strip of leather at the 12 o’clock high position so you never lose your sense of dead ahead wheel position. The rest of the cockpit is similarly constituted like a fighter plane. 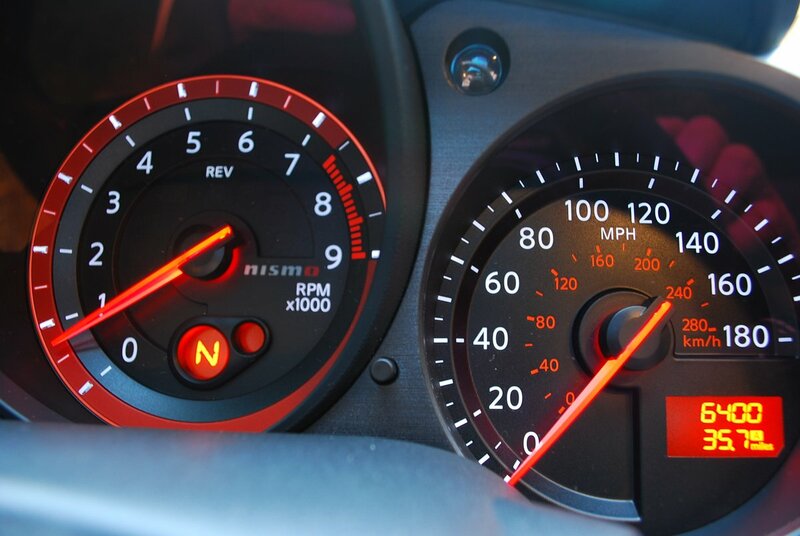 A huge red lit tachometer reads to 9,000rpm, with a redline set at 7,500rpm. In case you miss the ultra quick needle sweep, there’s a red light on the instrument face that flashes each time you hit 7,500rpm. The manual 6-speed transmission is a blast to operate, with short, predictable throws that are confidence inspiring. In a week of driving the Nismo, I never got a gear I didn’t want. With a car this acutely tuned to high performance, a couple of drawbacks in daily driving are worth noting. 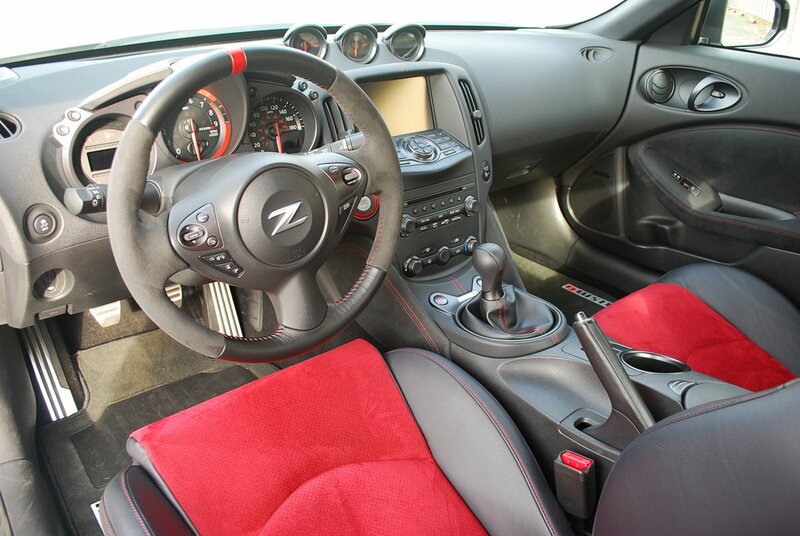 The ride is harsh, the Recaro seats are thinly padded, and visibility to the rear is poor. 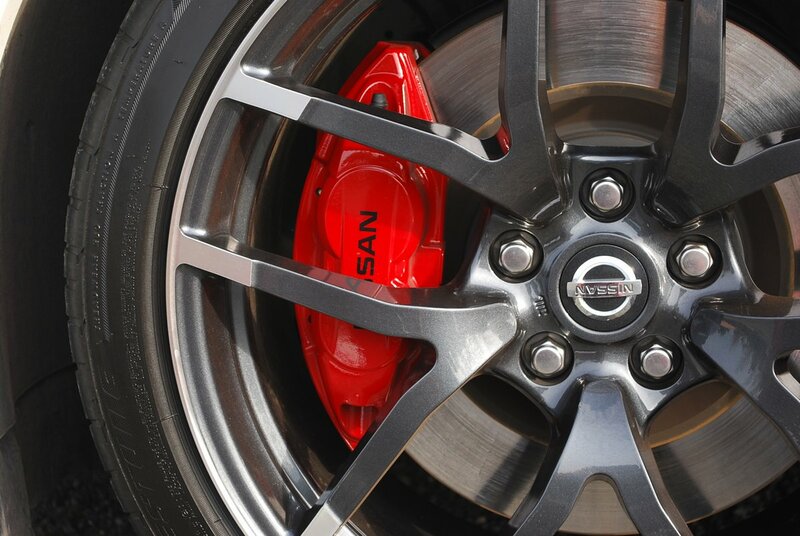 If feasible, you’ll want to park the Nismo in such a way as to permit you to drive off forward, rather than backing up. Also, the heavy rear hatchback lid is tiresome in its operation. For starters, there’s no activation button for it on your key fob. Secondly, the cockpit release for it is oddly hidden on the windshield header, rather than on the lower dash where you would expect to find it. Finally, if you use the small exterior switch on the lid itself, you’ll find the first push fails to release the lock, thus requiring a second push of the button. But you quickly learn to slough off these minor quibbles in exchange for the consummate pleasure of playing racer with this great classic sports car. At the price, the Nismo is a phenomenal bargain, and if you love sports cars, you should buy one right now. Because soon, they’ll all be gone forever.